If you own a Leica TL2 and Visoflex electronic viewfinder, listen up. Leica has released a firmware update that will keep the Visoflex finder from breaking your fancy new camera. 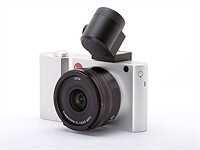 If you purchased a Leica TL2, do NOT attach Leica's Visoflex electronic viewfinder. Leica is working on a fix, but for now, it's possible the viewfinder will break your camera.